Some of the common fakes and forgeries are shown below, please email if you have any information of other forgeries. 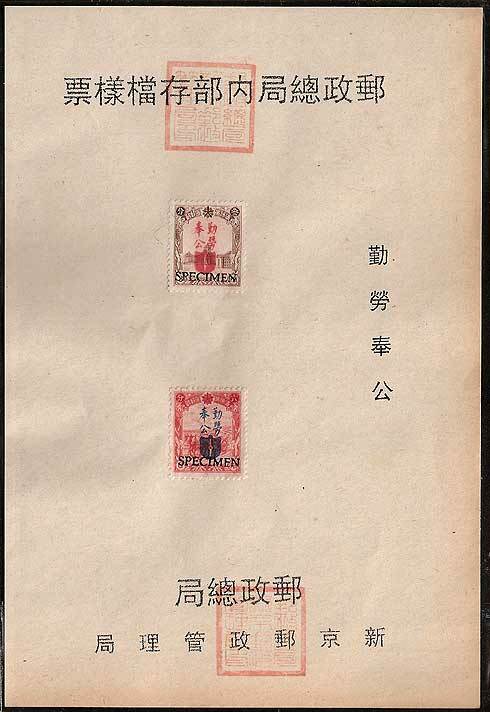 This looks like a convincing example of 1935 surcharge (3f on 4f - no watermark) in this instance inverted. 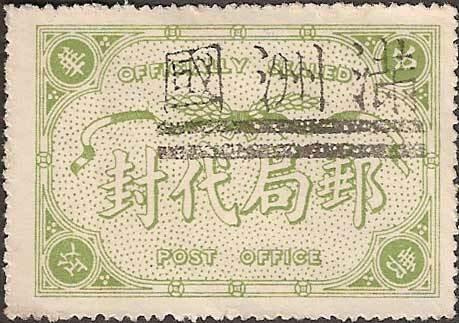 There have been no reported sightings of an inverted surcharge in over 70 years since this stamp first appeared - this copy is a fake. 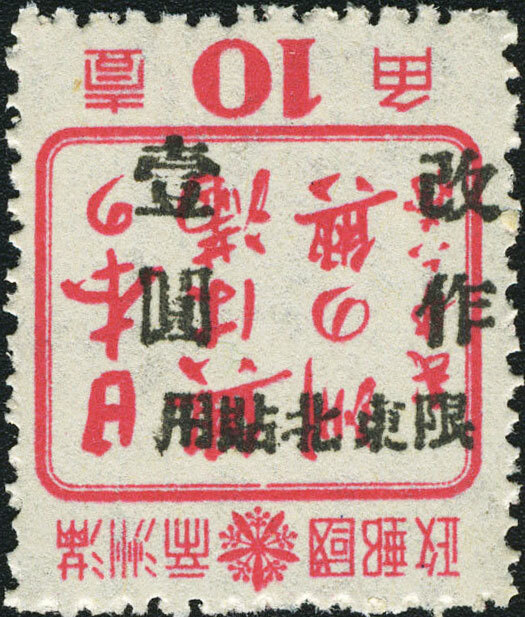 The most obvious error is the cancel date - the 21st Year (廿 _ over 年) and also the way the Date Number, 年 Year Character and Town Characters all line up, find me another example where this happens - look at your used stamps and you will see that the 年 (year) is always too close to the edge of the circle for a town character to appear directly below it. 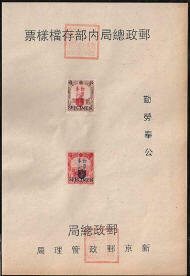 This item was advertised as a very rare Manchukuo telephone bill. 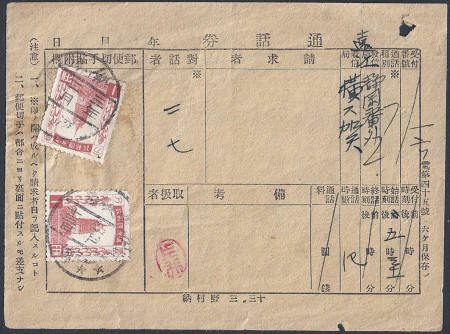 It is a telephone bill but it is Japanese (the box on the right "Office originating call" is Shizuoka. 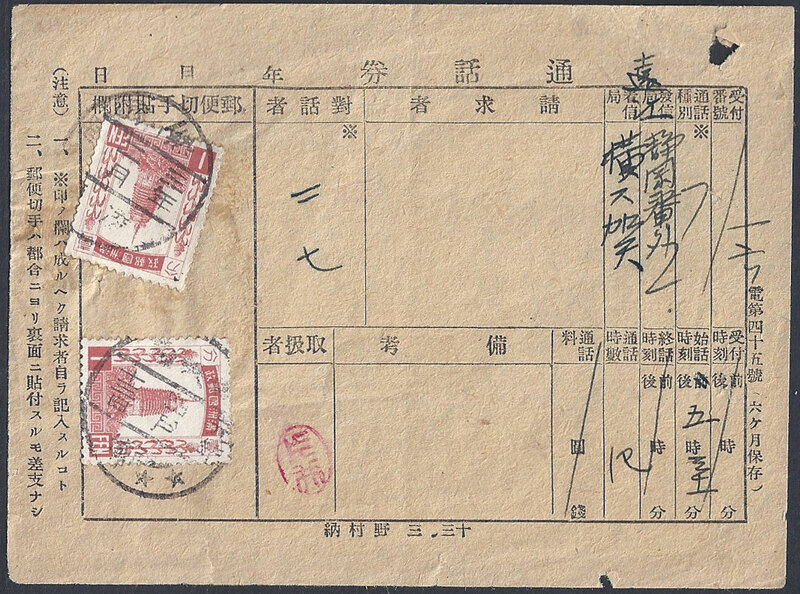 Box to the left of that "Office receiving call" is Yokosuka). 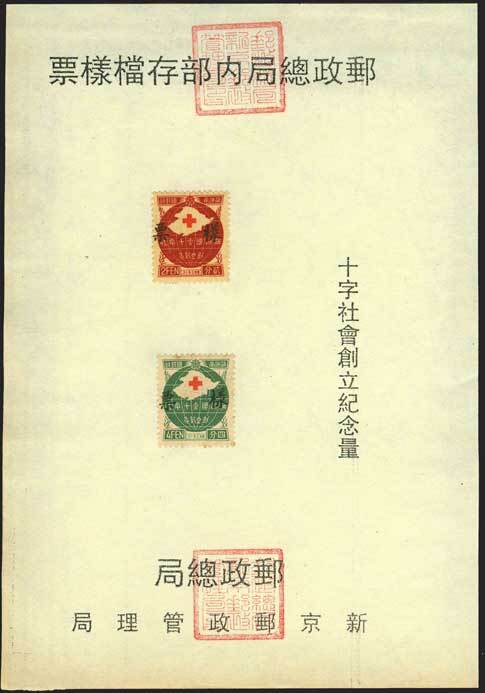 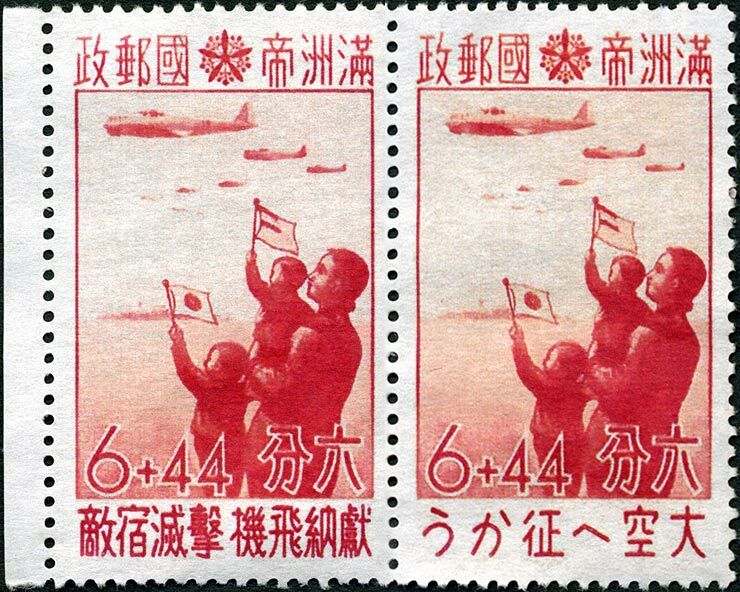 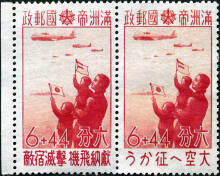 The Japanese stamps have been removed and replaced with two from Manchukuo. 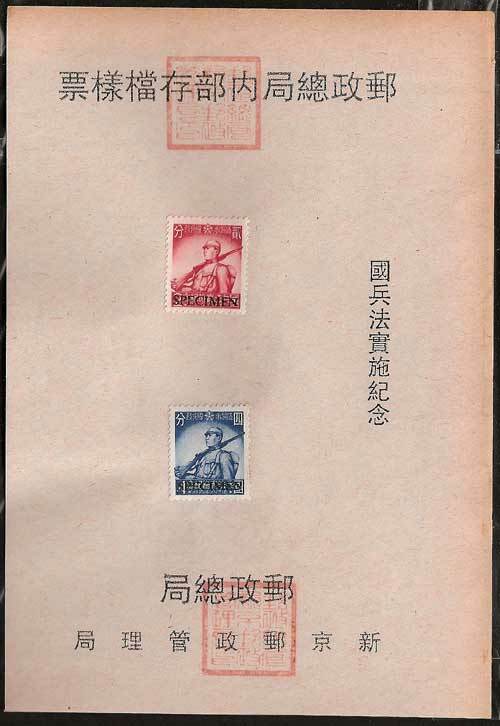 The faker did a reasonably good job of aligning the postmarks to match the Japanese originals. 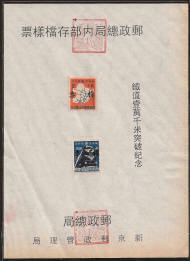 Needless to say it was sold in an online auction (you know the one). 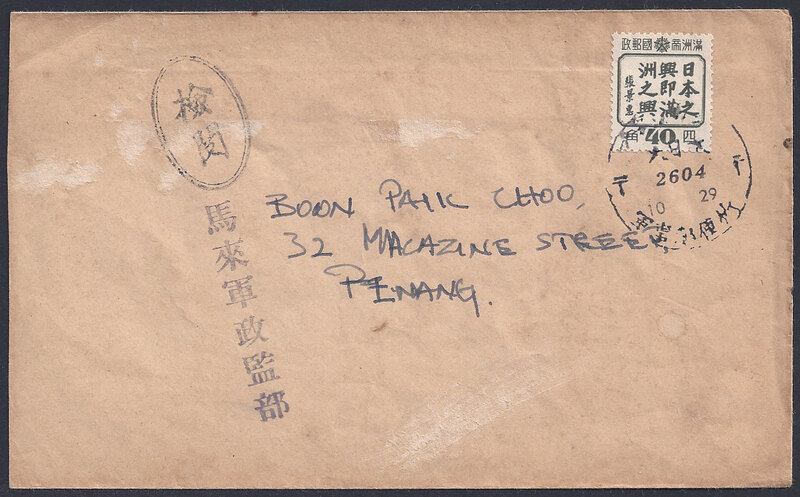 The item was returned so it is still out there somewhere folks! 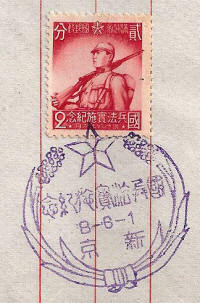 Hot off the presses from the boys in Beijing. 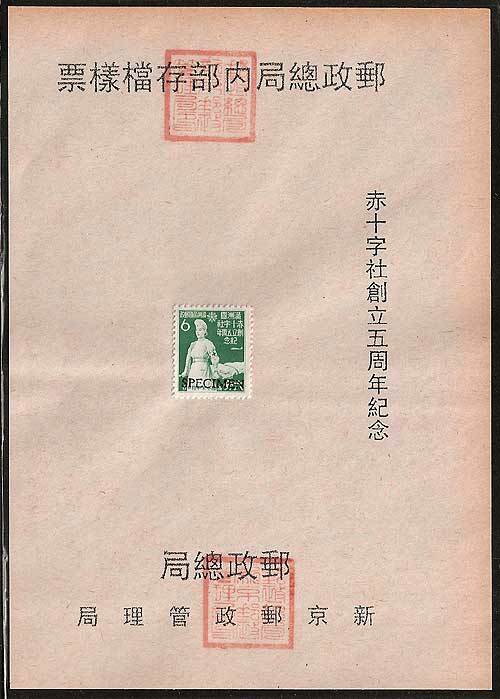 試樣片 Specimen overprints on the 1936 Fourth Regular Issue (First Printing), these started to appear in May 2013 with or without punch holes. 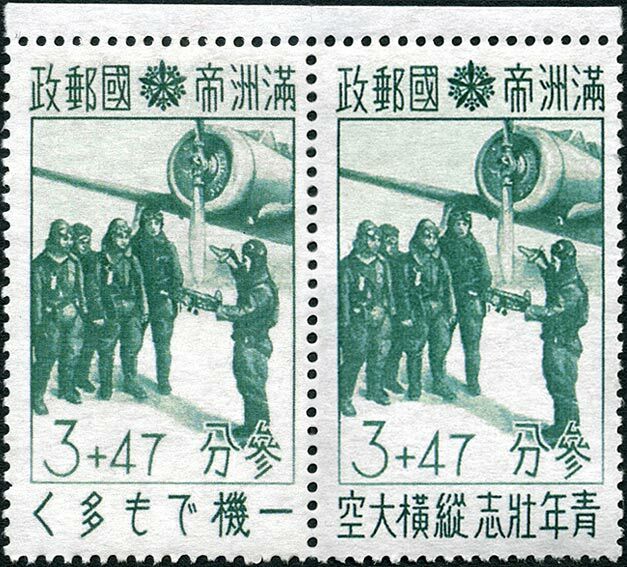 They are bogus. 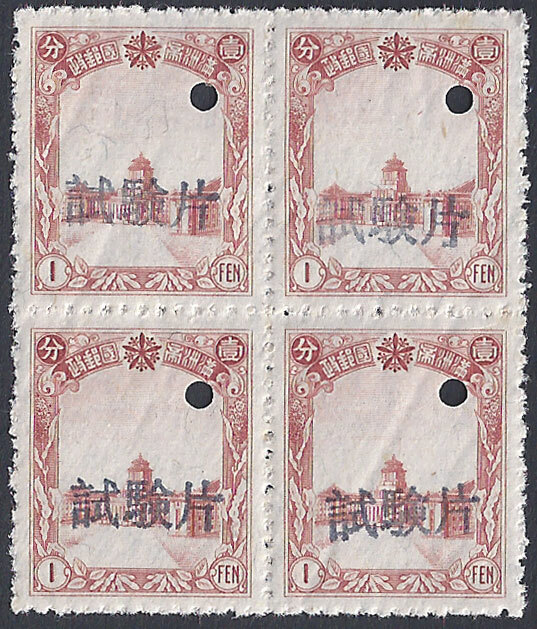 Many of these forgeries, often on lined paper, were made around 2009 in China, most of them appear to have been sold through a large Chinese online auction site and some by a stamp dealer in Ginza, Japan. 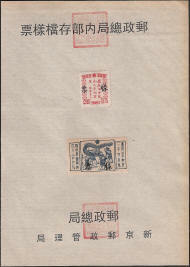 A few copies later found their way into the hands of collectors though Western online auctions. 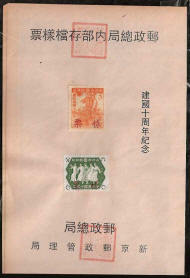 My thanks to Hiromasa Iitsuka editor of the Journal of the China Philatelic Society of Japan for confirming that these items are fakes..
Stamps described as "Reproduction Art" have been appearing recently on online auction sites, The terms of the online auction in question state that all forgeries offered for sale must be marked "FORGERY" on the back. 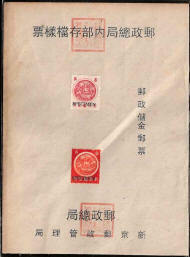 This rule was ignored by the seller. 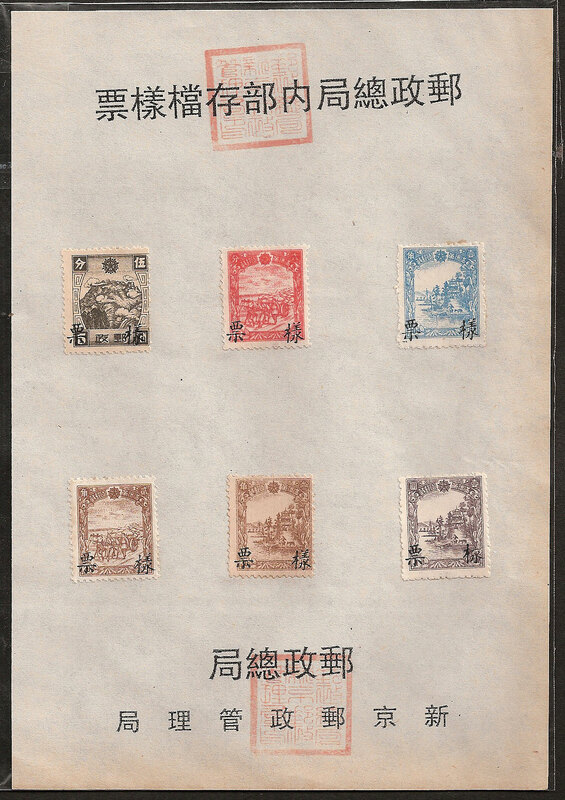 The seller purports to be German but the fluent Chinese used in the description probably points to the fakes being made in China. 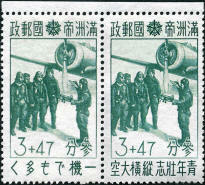 These are said to have the correct perforation and be complete with gum. 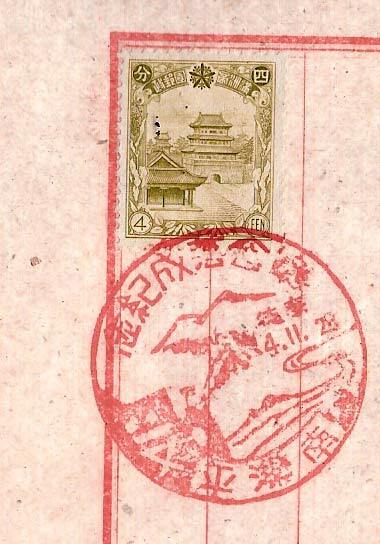 The problem with a forgery like this is that most collectors will not have seen the originals, making it very hard for the ordinary collector to tell the difference between forgeries and the original stamps. 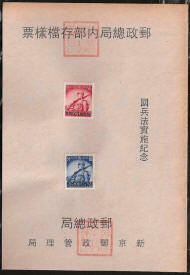 Fortunately the quality of these fakes is not sufficient to fool an expert. 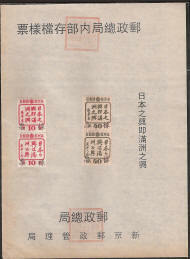 Click here to read about the original issue. 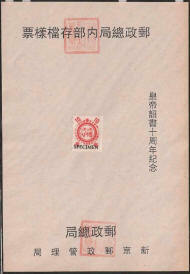 For the past few years specimen stamps on sheets, have been appearing for sale on online auction sites. 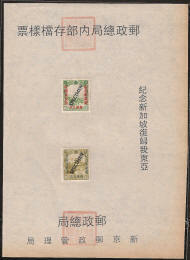 These sheets are not mentioned by Zirkle, Schumann, Akagi or indeed any other writers on the subject of Manchukuo stamps. 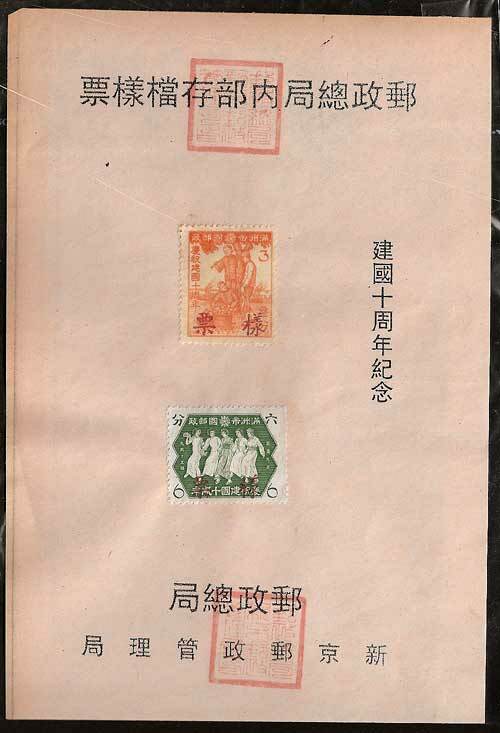 Having canvassed several knowledgeable dealers, the consensus of opinion is that they are fakes recently produced in Beijing. 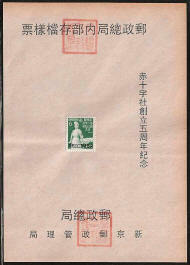 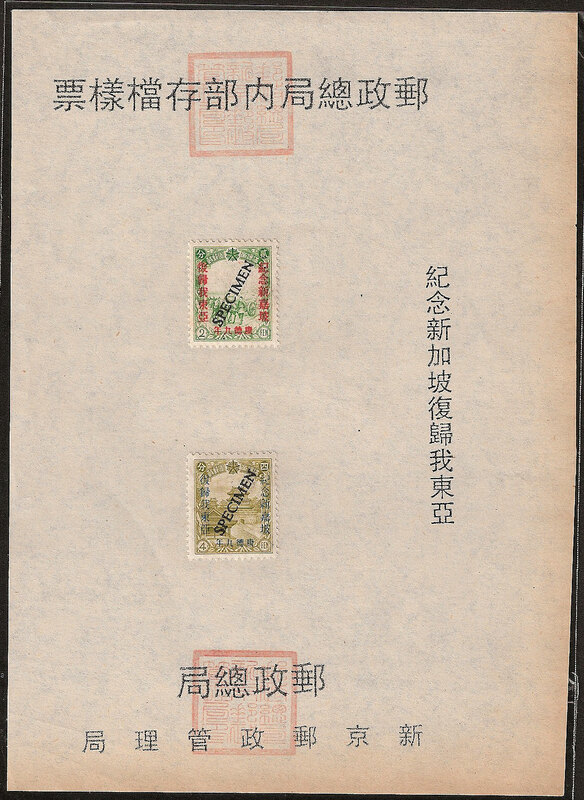 Manchukuo never issued specimen postage stamps in this form. 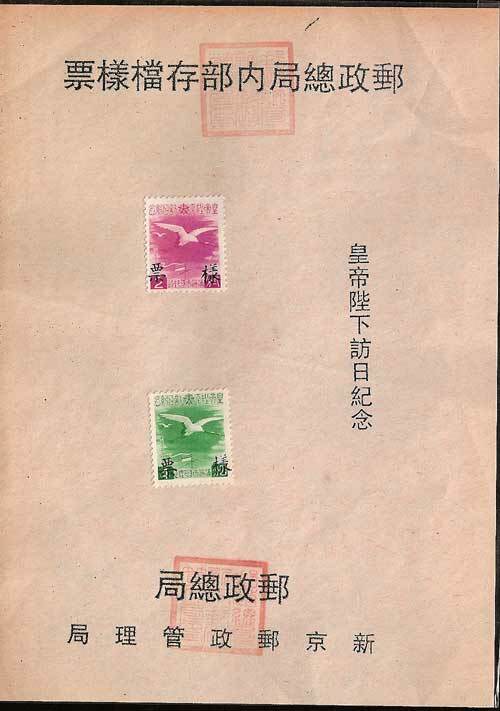 The Post Office of Manchukuo introduced new stamps to domestic postmasters, and to member countries of the U.P.U. 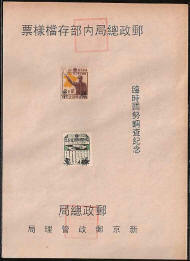 in a special presentation booklet (some examples are shown in this website). 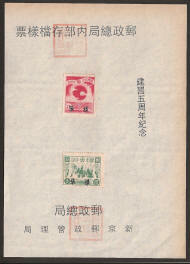 Following the Japanese practice of this time, these two page folded booklets explained the background of the new issue and contained sample stamps to be used for reference purposes, these stamps were not overprinted. 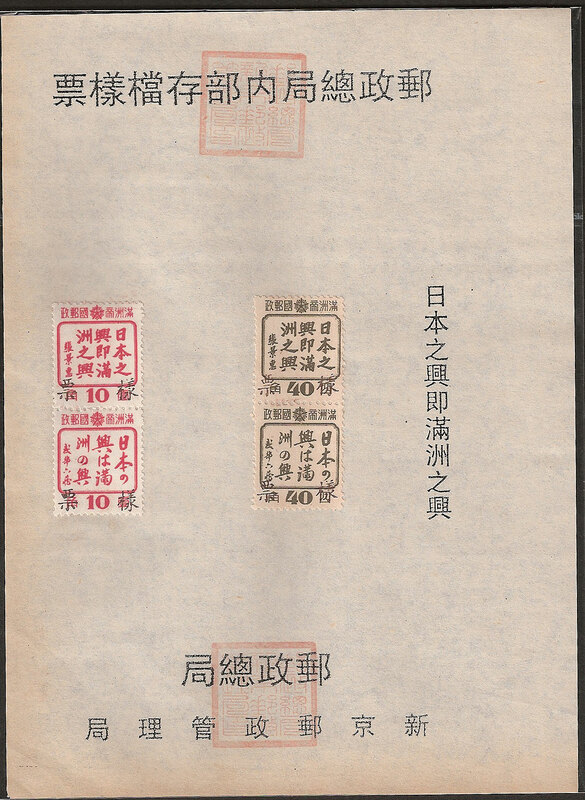 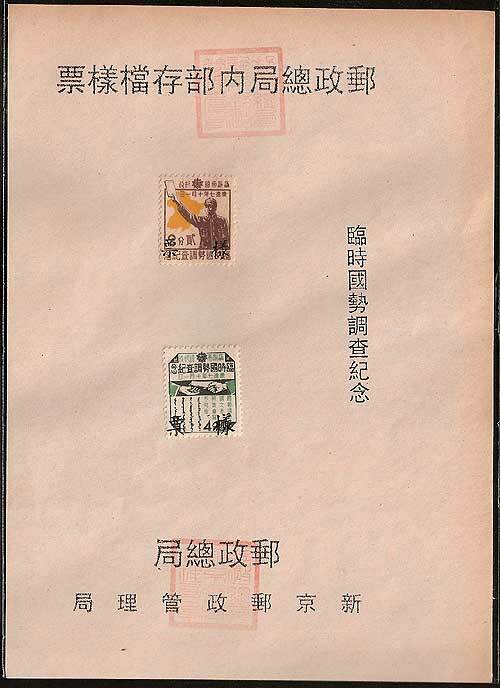 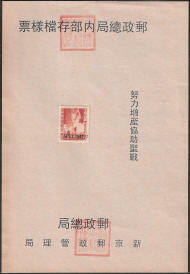 Money Order Stamps and Postal Saving Stamps (first issue only) can both be found with a specimen overprint in Chinese, however these were also distributed glued into booklets and were never issued on printed sheets. 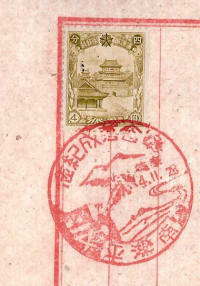 The characters for the term "specimen" used on the genuine Money Order Stamps and Postal Saving Stamps could be applied to specimens of anything, ie; blood, etc., the characters used on the fakes are reserved for banknotes and stamps, so while technically correct, were the wrong form for Manchukuo. 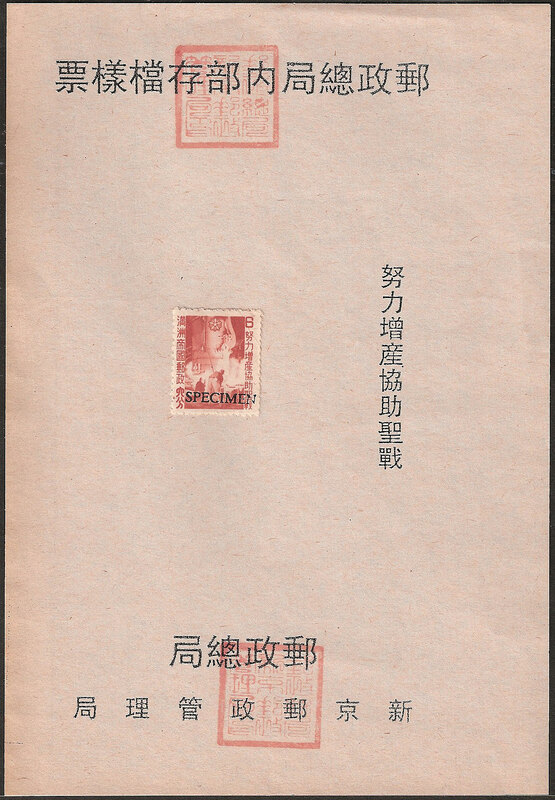 Postcards were also circulated in a special presentation booklet and these also never carried a specimen overprint of any sort. If you bought these sheets recently it might be possible to obtain a refund, if not, take the long view and hope that in 50 years these also become collectable. 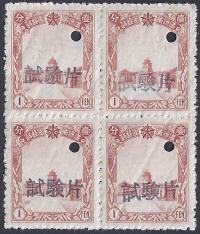 Currently they are pretty but worthless. 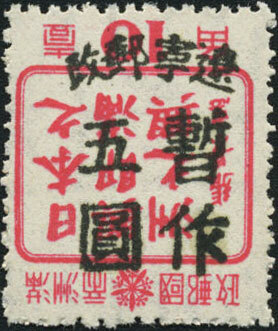 It is very hard to find genuine provisional overprints on "Officially Sealed" labels, when you do so they fetch high prices. 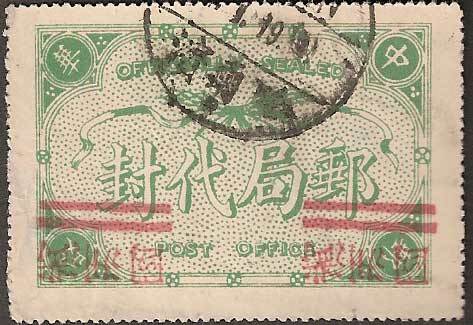 Unscrupulous dealers trade on the fact that you probably will not have seen real examples, and so will not recognise fakes. 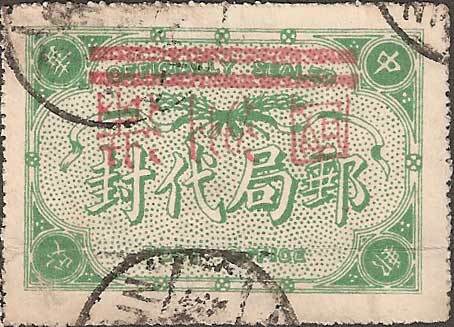 Unless you are sure of what you are buying, do NOT buy these in online auctions, if you do there is a high chance that you will be wasting your money. 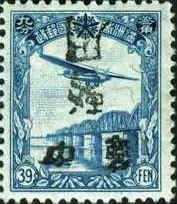 If you find that you have already have bought forgeries ask for your money back. 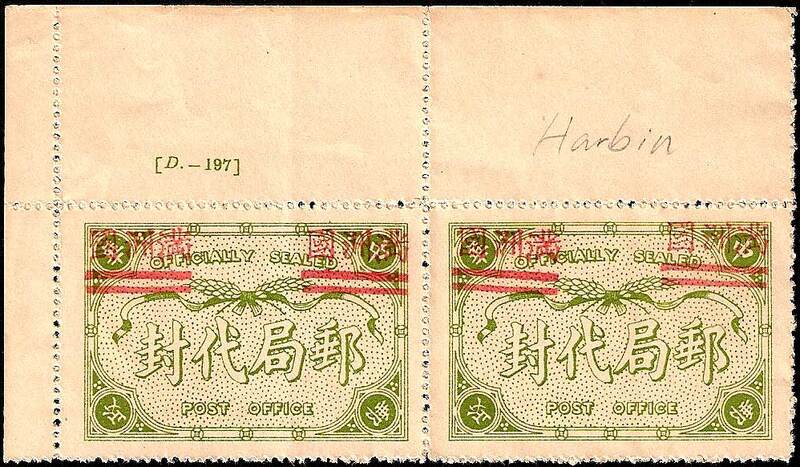 Below are some examples of fake labels and some tips to help you spot a forgery. 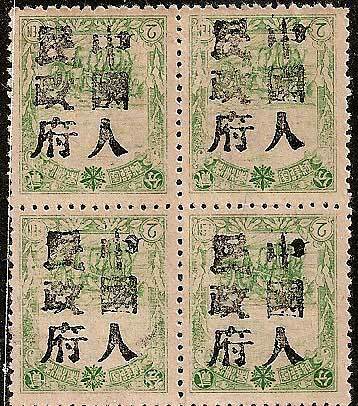 Above - forgeries of Kirin 2 bar overprint (the most common forgery). 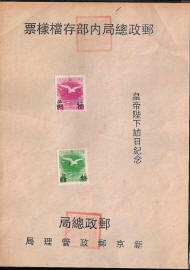 You will see that three of the labels above are yellow green in colour. 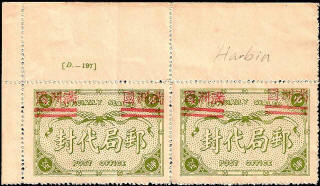 The yellow green label was produced 1936-1937 with thick paper and after 1940 on thin paper. 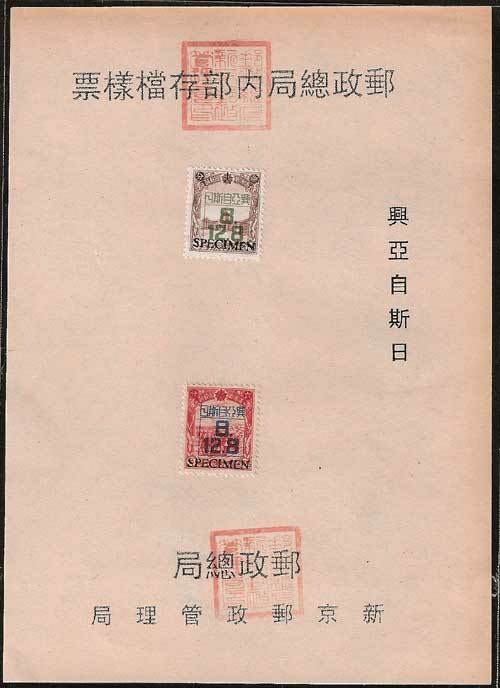 The overprints were phased out in 1933 when Manchukuo post office labels were produced. 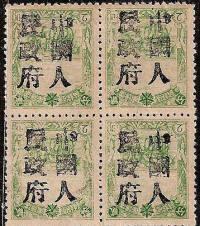 It is impossible therefore for any of the nine labels shown here on yellow green labels to be genuine. 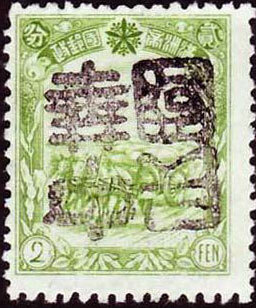 Above - again a forgery of the Kirin "Man-chu-kuo" overprint. 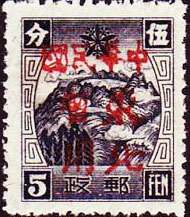 This time on a stamp postmarked 1930 two years before the birth of Manchukuo. The helpful thing about this piece of idiocy is that it provides a sample of a chop that must be fake, thereby making it easy to detect other fakes by comparison. 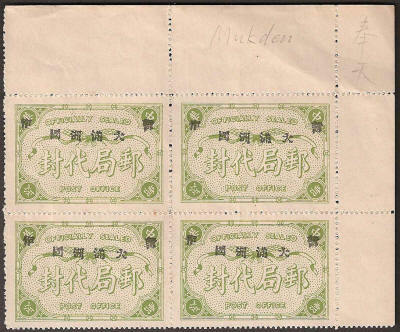 Forgeries of the Mukden (Moukden) overprint on yellow green labels, this particular version of the label is thought by most experts to have been printed in 1938, too late for the early days of Manchukuo when this overprint would have been applied. 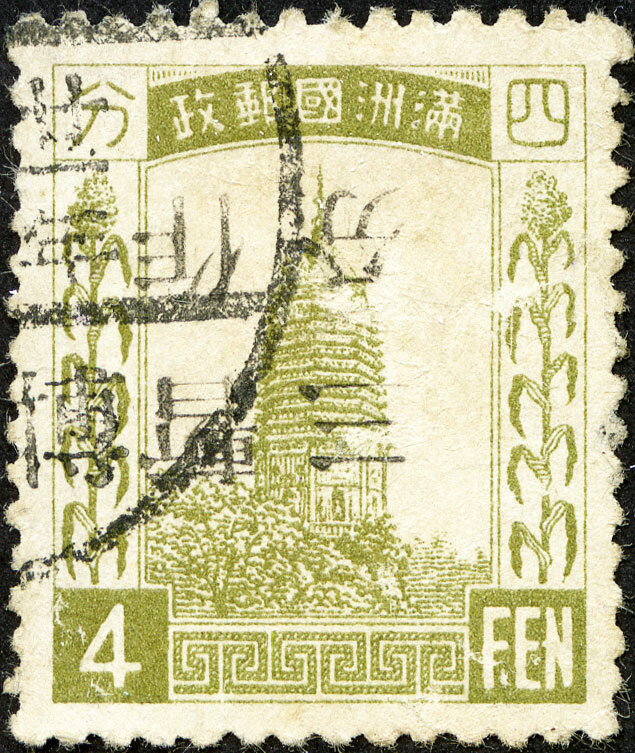 Forgeries of the Harbin overprint on yellow green labels. 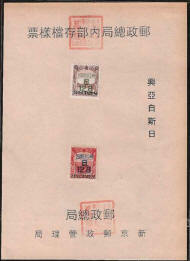 My thanks to Professor W T Chen for his help in the identification of these forgeries. 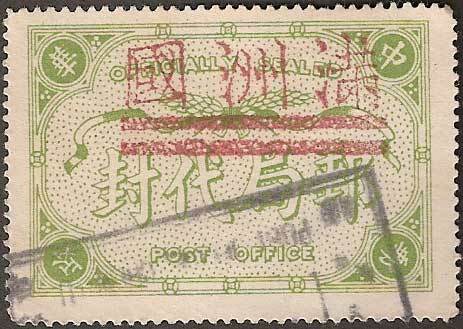 Many collectors like to find revenue stamps in use on an original document, this helps to put the use of the stamp into context and provides evidence for dating etc., This is great if the document is genuine, but misleading if the document is a fake or has been tampered with. 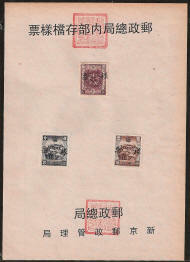 The document shown below was sold on eBay as a Bank Document with a 1 Yuan revenue stamp. If you look carefully at the stamp however you will see a series of dotted lines running vertically, these lines are only on the stamp and do not continue onto the document itself. 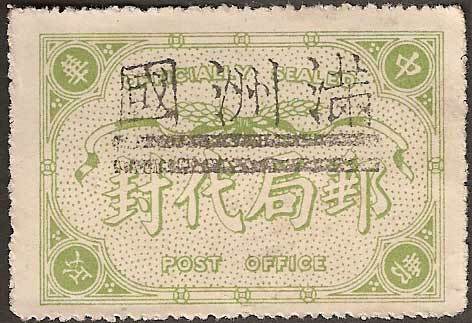 The dotted lines are typical of a stamp used on a court document suggesting that the revenue stamp had previously been used to pay a court fee before being added to the fake bank document. 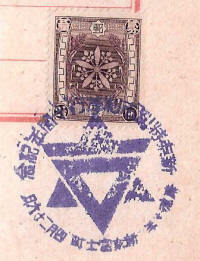 The black mark at the top of the stamp will hide a character. 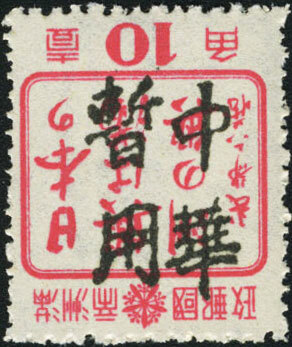 Between the dotted lines there are usually characters reading "Cancelled by Court". 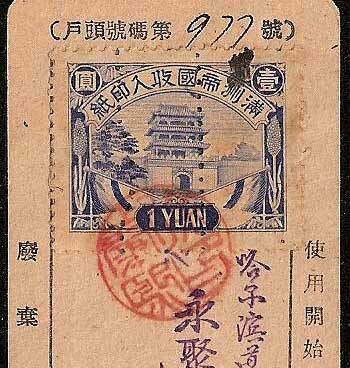 My thanks to Professor W T Chen for his help in the identification of this forgery. 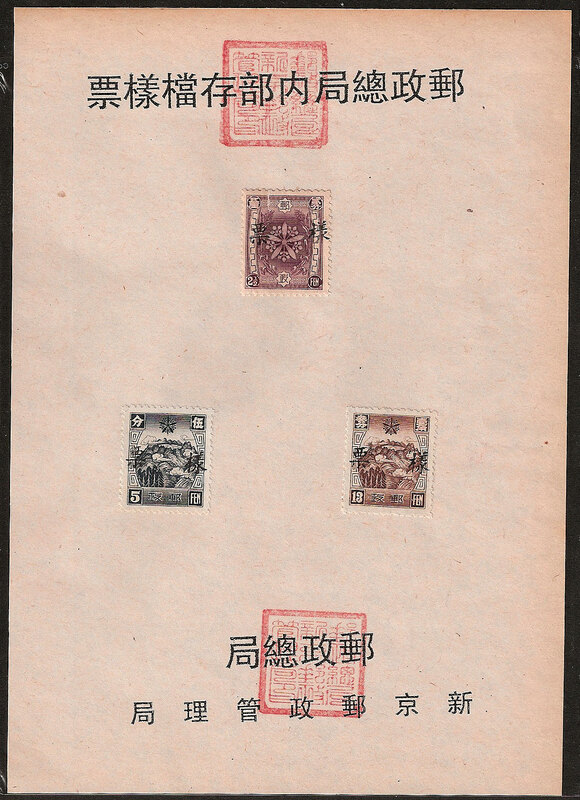 Fake Manchurian Local Overprints are not hard to find, inverted copies once scarce are now common. 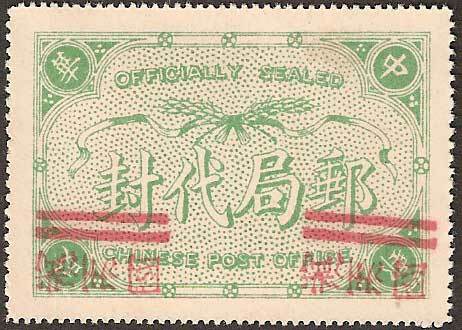 This must be discouraging collectors although it does continue a long tradition as many of these stamps were originally produced by inventive dealers. 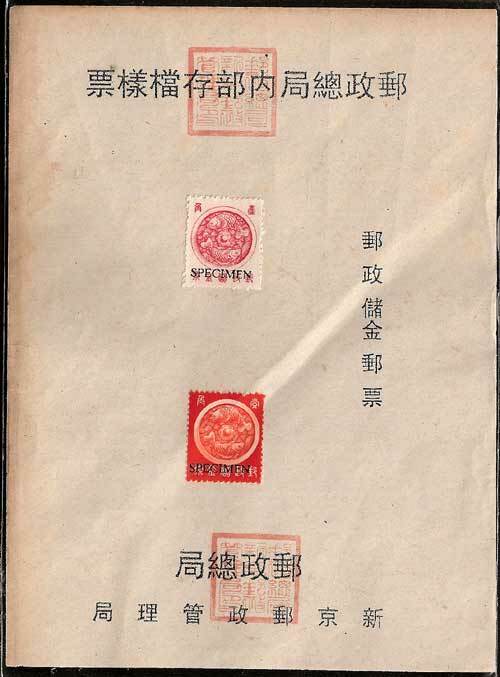 Dealers in Beijing again seem to be at the heart of this new production, there is so much dubious material in the West now, that as it changes hands, it will gradually dilute stocks of genuine items. 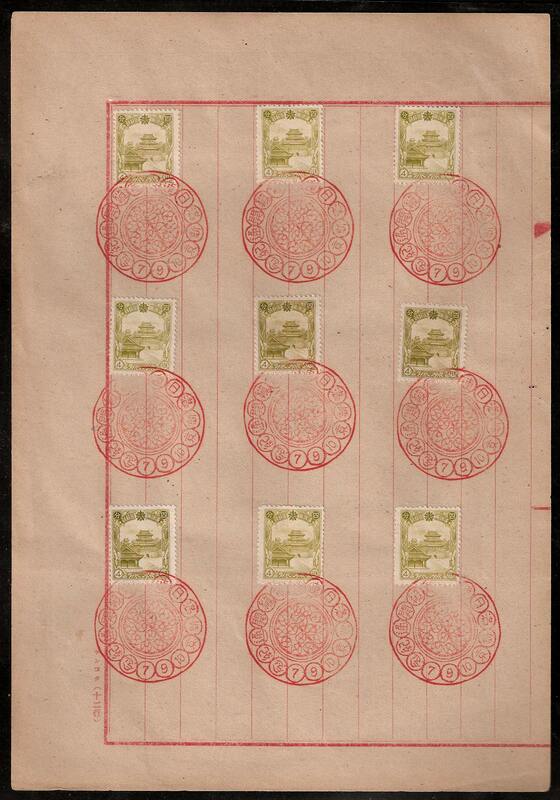 Once you have seen enough genuine overprints it is possible to recognise some of these fakes. 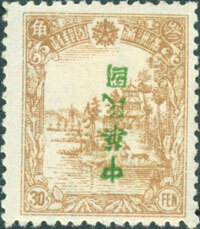 Often the colour of the overprint is wrong or the overprint is a direct copy from Kerr. 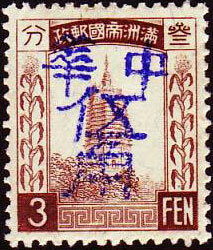 Kerr's drawing are sketches and have errors, by comparing your stamps with photographs of genuine copies, such as those shown here on the website, or in Chan, you can protect yourself to some degree from collecting fakes It should be noted that I cannot guarantee that this collection is forgery free!. 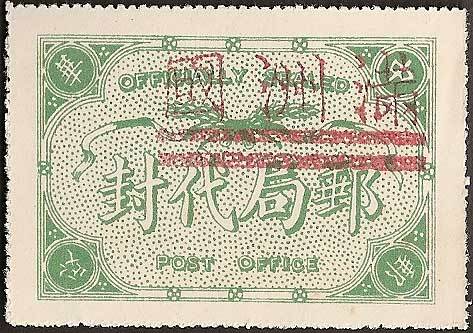 Sensible precautions to take when buying, must be to only use dealers you trust, treat any inverted items that are not mentioned in Kerr or Chan with the utmost suspicion and try to buy from old collections when you can. 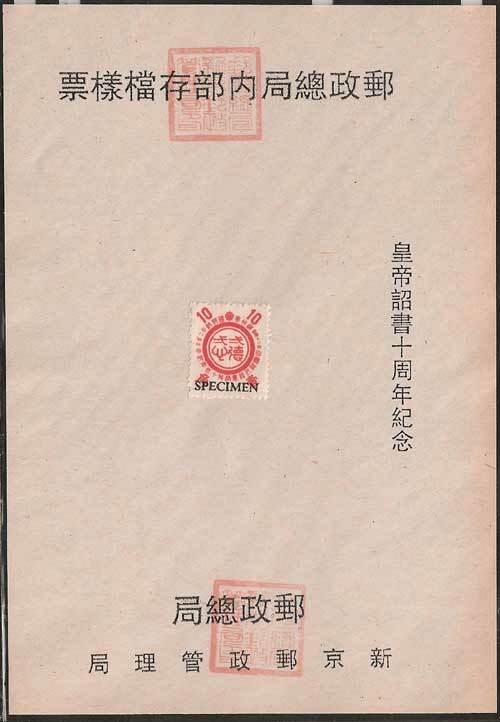 Any other sources must be considered doubtful. 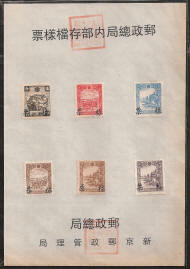 This is a just a small selection of fake items seen on eBay and elsewhere. 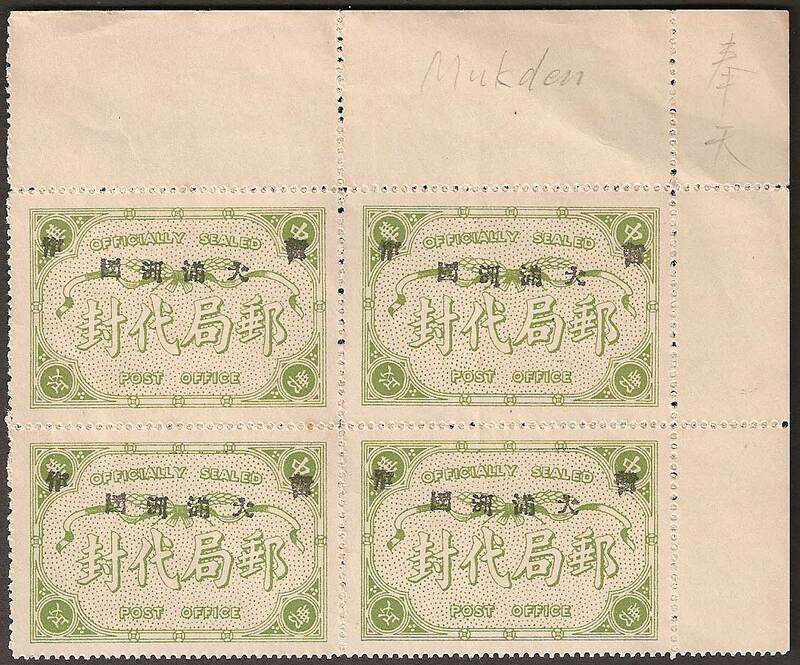 These are a very unusual fantasy items - covers with stamps from Manchukuo used within Malaya (Malaysia). 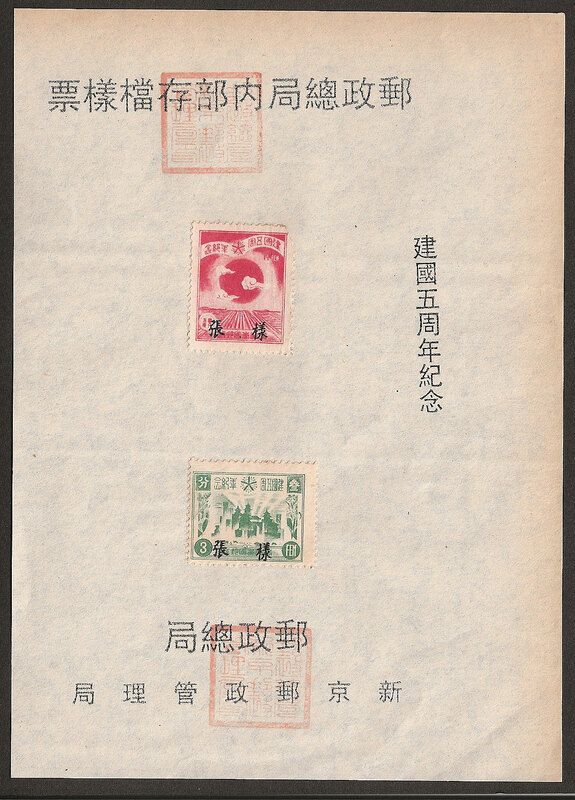 It is thought that such covers appeared at the end of WWII in a range of forms. 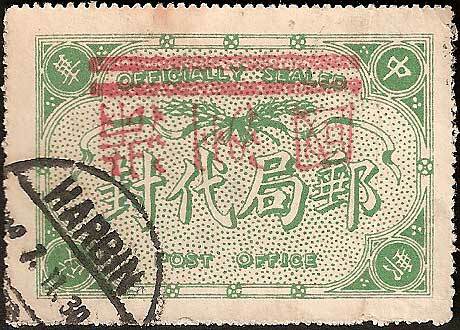 The use of stamps from Manchukuo in Malaya did not to my mind automatically rule them out, this is because Malay Post Office workers were used to stamps from Japan and soldiers may have travelled to the area from Manchukuo with stamps they wanted to use (although this is very unlikely). 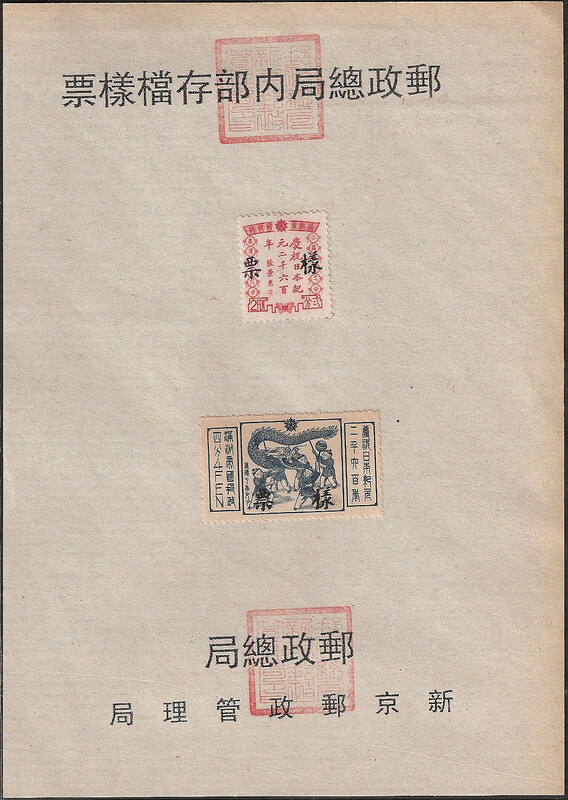 In this instance I had to ask the advice of expert collectors and members of the ISJP and the best summary came via Ken Bryson (ISJP Librarian) to whom I am indebted. 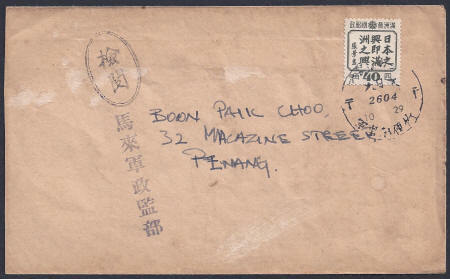 He noted the following - "The cancellation is one that was used on the Thai-Burma Railroad at military post offices (gunji yūbinsho). 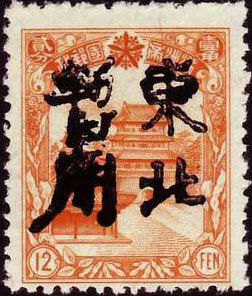 Although indistinct the place name looks like プランカシー which was in fact one of these offices. 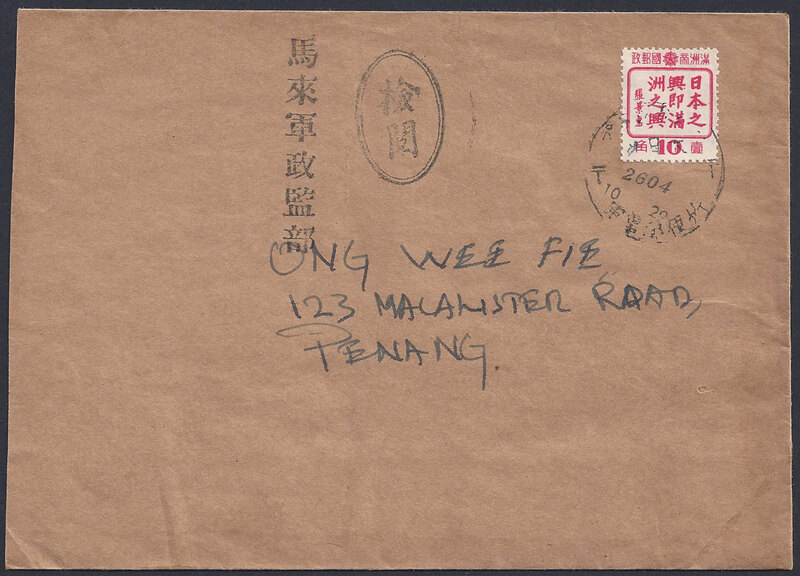 These offices were manned by Malay personnel, who did send mail back to their colleagues and families in Malaya as seen in the illustrated pieces. 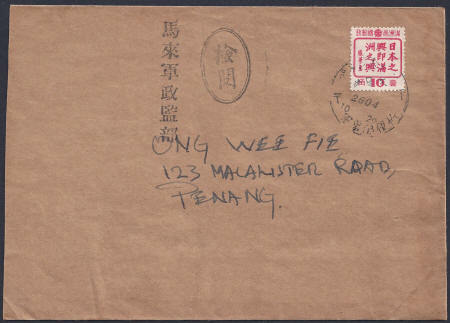 However the “censor” mark doesn’t match the type apparently used at the rail line offices; the “Malay Military Government” rubber stamp doesn’t agree with the purported origin of the piece; the date font in the cancellation doesn’t match the date indicia on the genuine cancels, and one of the dates doesn’t align with the rest of the cancellation; also there are no receiving marks". So in short, these are intriguing and unusual 70 year old Fantasy items, I had a similar but less detailed summary from Richard Arent, also a member of the ISJP.